The pendant measures 18x48x9mm, the natural Black Tourmaline is wire wrapped with 21 gauge copper wire. Images show front, back and wire detail, the pictured pendant is the one you will receive. Black Tourmaline is also known as Schorl and is associated with the root chakra so it’s very grounding. It is able to remove negative energies with ease from an individual or environment and once the negative energies have been dispelled it will then deflect it from returning which is what makes this such a popular crystal to use for powerful protection. It is also said to repel black magick and will return the negative spell to the sender. Black Tourmaline I find can also take you to a level of higher awareness so would be great for psychics and those who seek psychic awareness. I have a piece next to my computers because it deflects the radiation, can also be used with mobile phones, DVD players, television sets etc etc. This is also a good crystal to strengthen the immune system and would help with gout, heart disease, panic attacks, fatigue and also arthritis. You can make an aura cleanser by placing Black Tourmaline in a glass of water overnight and then adding the water to a spray, mist bottle which you can use on your body or environment, you will really notice a big difference too. If you feel you are being victimised by the negative energies of another then carry or wear this powerful crystal to protect yourself, it will also stop other people from draining your energy. This crystal is very beneficial if you are feeling sad, lonely, and depressed and everything you see is just doom and gloom, it will remove all these negative energies and will replace them with positive ones. 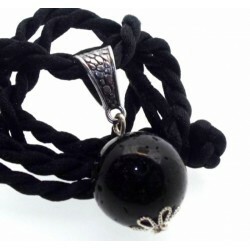 Black Tourmaline is also great if you suffer with lower back problems or spinal injuries.